Mark Maremont is a senior editor at The Wall Street Journal. He graduated from Columbia Journalism School a few years after earning a history degree from Brown University (though he didn’t work for The Brown Daily Herald, he did work for the news radio station). 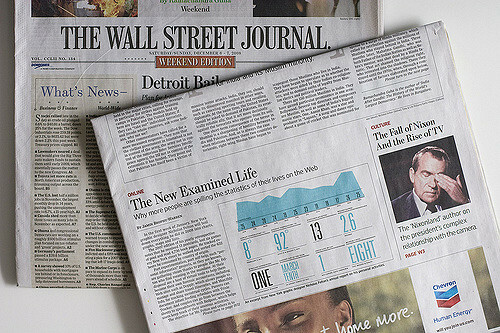 In 2007, Mark and his investigative team at The Journal won a Pulitzer Prize for Public Service for a uncovering an executive stock options backdating scandal. We spoke with Mark about journalism careers, covering the world of higher education and, of course, investigative reporting. And stay tuned at the end for a war story from the field! How’d you get into a journalism career? When I was finishing up at Brown, I did my thesis on something that had happened about nine or ten years before I graduated, which to a 21-year-old seems like history, but to the professors it was like current events, practically. The main professor, in one of his comments on the thesis, basically said, “Have you ever considered a career in journalism?” I really hadn’t at that point. A couple years after college, I worked in a marketing role for a company, and I was really, really bored. So I started taking classes at Northwestern University in Chicago at night in journalism, and started writing for a local free newspaper that was in the city that they put on people’s stoops once a week. I got some freelance assignments out of them, and decided I liked it a lot better than what I was doing. I actually went to journalism school at Columbia University, which you don’t need to do. But when I’d started applying for journalism jobs, because I liked writing for the newspaper… I’d present them with these little clips from the free newspaper, and they laughed at me. The other funny thing is, I got through college not knowing how to type. I would handwrite my papers, and then they had these secretaries at the college, or various people in the community, and you could take your paper to them and they would type it up for you. And for 75 cents or a dollar a page, it was expensive. So when I was going to journalism school, I realized I needed to learn how to type, so I actually went to a secretarial college in downtown Chicago. I was the only man in the class, but I learned how to type. What can students do now to prepare for a journalism job? Do they necessarily need to go to journalism school? Should they get that field experience? What are some tips and tricks for getting into that career? Well, I’d say that unlike medicine or law or something like this, you definitely do not need journalism school, or a journalism degree. It’s what we always term a “trade;” it’s not a profession. And most of the people, including most of the very successful people that I know who are in journalism, did not go to journalism school or major in journalism. I mean, there are a number of successful people who did, but it’s certainly not necessary. It was helpful for me to the extent that Columbia sort of gave me a stamp of approval for possible employers. It’s like a filtering mechanism. So, if I was decent enough to get into Columbia and get through, I was worth looking at as an employee. But there are many other avenues which are just as good, if not better, and a lot cheaper, to getting into journalism. What resources do you recommend for student journalists who want to do data reporting and investigative reporting on their campuses? Well, there are certainly a lot of resources. You’d be surprised sometimes what’s on the college’s own website, or things that you can ask for from the college… There’s some very good Department of Education databases that have lots of information about financial aid, a number of administrators’ salaries, race... Last I looked it was a very difficult site to navigate, but you can do it if you are persistent. You can go compare one school against its peers, for example, or against others… Every college is required to send a certain base level of information in, and a lot of people just don’t look at this stuff. Do you think it would be possible for a school to make an investigative team? Would you recommend them putting one together? It’s possible. One thing I would recommend is looking at other student newspaper investigations over the last five or ten years, and saying, “Could we do that sort of thing at our school?” Obviously the sexual assault issue has been a hot-button. But, I’m sure there are others. Malcolm Gladwell was doing a podcast about higher education, and I took some exception to one of the recent episodes which I listened to, about whether better food at Bowdoin College was linked to a lower number of students getting Pell Grants. In other words, basically, there’s a trade-off between better food and financial aid money. Which may in fact be true, but I thought his podcast didn’t prove it. And in fact, I thought it was lazy journalism, and deceptive, to some extent. But I think there could be some interesting questions about what the trade-offs are, and lots of other things that one could ask about your college. Who are the people who are on financial aid, and where are they really coming from? What’s the real cost of going to school? How many people are really paying full ride, and what are people paying for different family income levels? A lot of that information, I think, can be gleaned from that federal Department of Education data. Were you ever on an investigative team? Were you officially an ‘investigative reporter’? How did you get into that side of reporting? I got interested in it when I was in London for many years. I just like doing investigative stories, and I found a few interesting ones when I was there. I came back from the U.K., I did a number of investigative stories here, and it was just a lot more fun than regular reporting, to me. It’s like a big detective thing. And if you get on to a good one, the impact is large sometimes. At the Journal after a while, I actually became the head of a small investigative team, and our team won a Pulitzer Prize in 2007 for some stories we did about executive compensation abuses, where executives were manipulating their stock options dates to make millions of dollars more in money that they weren’t entitled to; in some cases hundreds of millions of dollars more, individually. I’m now part of a wider investigative team which is headed by an investigations editor in New York. But we’re still doing a lot of good reporting on our team; not necessarily me all the time, personally, but we have ten or eleven people on the team, so we do a lot of good stuff. What motivates you to do good investigative reporting? I think that’s a complicated question, and it maybe shifts a little bit over time, but I actually feel that the press has an important role to play in policing things. I subscribe to something that our former managing editor at the Wall Street Journal said: we believe in free enterprise, but sometimes people get out of hand. So I do believe it’s an important role for us to play, and I’m proud. I also personally get outraged or angry by some of the stuff that we’ve seen over the years that I’ve investigated: all kinds of abuses and things that are hidden from employees or shareholders, or from taking advantage of people, ripping people off in various ways… So, I have a sort of personal moral compass, and when the outrage meter goes up, I get more and more invested in these things. The other – and this is more of a personal, maybe more selfish thing – is that it’s actually just fun. It’s when you get involved in these types of stories, it’s fun. I was doing a series with a colleague of mine about life insurance fraud, and it was about the business of creating and selling life insurance policies that were owned by other people… My colleague said in the middle of this, “I can’t believe they’re paying us to do this job.” Because it was so fun. Investigative journalism can be personally rewarding in the sense that it’s just enjoyable to do it, for certain types of people. What do you suggest that student journalists focus on this year? I think that the conflicting narrative about free speech and about political correctness and what-have-you on campuses is really an interesting area… questions about whether people are being intimidated over issues. For example: Israeli-Palestinian tensions and the boycott movement, or this whole question at Yale about slavery, and people talking about Halloween costumes. I do think that there are a lot of tensions around it, and how you cover them as a student journalist. Some folks are saying a student journalist can’t accurately cover certain things because the student news organization doesn’t reflect the campus diversity at large. Should people be taking opinions and sides, or try to take the just-the-facts manner of approach? I think these are very difficult questions that are controversial, and student journalists should be dipping into them and also getting a range of opinions about it. So, that’s one issue. I do think that access to higher education and the cost of higher education – I mean, as a parent of children who have been to college, it’s just appalling how much college has gone up. And the question is, why? What’s the money really being spent on? What’s the real cost of going there? I don’t understand why it costs $50,000 a year to go to a private university. The inflation of college tuitions and college costs has been absolutely astronomical. So, I like to ask pretty hard questions about what the money’s really spent on, and whether this is necessary. And investigation’s a big part of that? I think it could be. I mean, investigation sometimes is finding out something that people don’t know. It’s not necessarily finding wrongdoing. A lot of this is what I would say falls in the category of explanatory journalism, as opposed to investigative journalism. But sometimes there’s a lot of overlap. I think there are two types of investigations. One is what I would call an archaeological investigation: something’s happened, and then you go backward and figure out how that happened. Somebody shoots up a nightclub in Orlando, then you go back to figure out who that person is, and how they were allowed to get a gun, and whether they were crazy. Or a company declares bankruptcy, and you go back and figure out what went wrong with it. But I prefer to do what I would call novel investigations, which are things that nobody ever knew anything about. How did hundreds of executives manage to steal billions of dollars by cooking the dates on their stock options without anybody knowing about it? Or, how did some executive at a pharmaceutical company get away with what was he doing to scores and scores of women, harassing them over the last decade? Anyway, that’s just another construct in the investigative journalistic narrative. Can you tell me a war story? Well, [Astra] was a fun one, but that was a long time ago. What year were you born? Yeah, it was in ’96. So that’s a long time ago. That’s an old war story. It was fun. I’m down to hear the story! Alright, well, so basically this is a story about a U.S. division of a European pharmaceutical company, which is now called AstraZeneca. And at the time, they had a Boston office, and it was headed by a very strong-willed local American CEO. A person came to me complaining that the company was discriminating against homosexuals, at the time. And I looked into it, which seemed fairly interesting, but as I started looking into it, it seemed like it was a much broader story than that. The culture was, essentially, kind of a fraternity-oriented culture gone mad… Basically what they did was they hired a bunch of young people out of college and put them to work in this business. But what the CEO and his henchmen, if you’ll excuse the expression, were doing was they required a six or eight-week training class where everybody would stay at a hotel in suburban Boston. They weren’t allowed to leave, they weren’t allowed to go home. And they had mandatory bar night. You had to be at the bar three nights a week. And the CEO and his people had suites in the hotel, and they would invite certain people up to the suites, and went out to various clubs and things like this. They’d typically pick on attractive young women and make overtures to them and that sort of thing, and then it continued on and on. They would have one-week sales meetings three times a year at exotic resorts, and the whole thing was basically a bacchanal, with lots of drinking and partying going on all the time. Anyway, it took a long time to get this. I would call up people who used to work for this company and ask some of these questions, and there were some pretty horrific stories, particularly from women… But nobody every reported it. Or, actually a couple of people did report it, or tried to file an EEOC complaint. The company then settled with them on the condition that they never speak about it. It was a pretty intense thing. These people, actually, they set up, it turns out, a secret office to investigate me, or counter my investigation. And they hired a private eye to look into me, and they got ahold of my phone directory records and did a background thing on me. I actually started carrying pepper spray around because these people were really creepy, and potentially dangerous I think. So the CEO guy and I, he agreed finally to meet with me at a local hotel. This was McGraw-Hill, which I worked for at the time, Business Week. They sent an armed ex-cop up from New York to come meet with me with this guy; and he never showed up, I never met him. But it got very ugly, you know, the whole thing got very ugly. So we did our story. They kept lying about everything, they paraded out all these women, it went on and on. We found this really interesting stuff, including a calendar called “The Women of Astra,” where [the CEO] produced a calendar with twelve different women in suggestive clothes or in bathing suits, like, ‘Miss January…’ all kinds of just absolutely hair-raising stories. The parent company finally got wind of the investigation and fired [the CEO] just before our story came out, and then he got arrested for stealing money from the company, and was jailed for about three years. And it was a huge EEOC fine, huge. I can’t remember what it was, ten million or 30 million or something. It was a lot of money. And a lot of people got some compensation. It was a fun investigation.